White shoes look clean and crisp and lend themselves to a wide variety of spring and summer fashions. Whether they're made from leather or canvas, they can help any outfit look polished and stylish. The downside to white shoes is that dirt and grime shows up on them quickly. 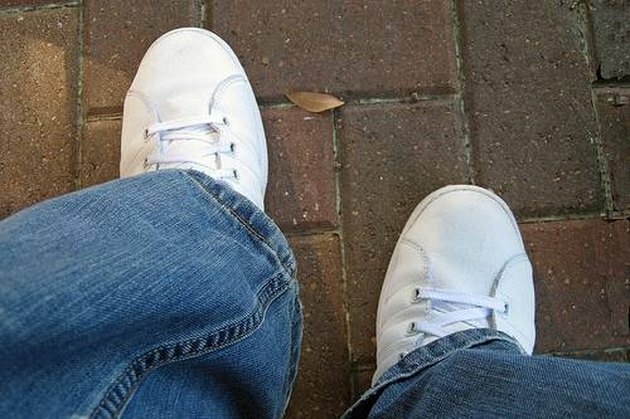 There are a few home remedies for cleaning your white shoes that are worth trying before throwing in the towel. You probably have the needed items in your home or can purchase them at your local grocery store. Clean your white shoes with one or more of these home remedies. Squeeze some fresh lemon or some lemon juice into about 4 ounces of cool water. Shake or stir to mix it together. Dip a new sponge into the liquid and wring it out. Gently scrub the stain, adding more of the lemon water as needed. If the shoes are made of canvas or another type of fabric, set them outside in direct sunlight and leave them there for several hours. The combination of the lemon and the sun might bleach the stain if the scrubbing process didn't remove it. Do not set leather shoes outside. Mix one part bleach to four parts water. Use a small scrub brush dipped in the liquid to scrub the stain. Rinse the scrub brush with clean water and continue to scrub the stain until it is gone. Be careful not to get the bleach mixture on any clothing or fabric. If the shoes are made of leather, be sure to dry them completely and treat them with a shoe oil or paste. The bleach can cause the leather to dry and crack if it isn't removed completely. If the shoes are made of canvas or fabric, try setting them out in the sun after the bleach treatment. Make a paste with baking soda and water and spread it on the stain on your white shoes. Once the paste dries, scrub over it with a dry scrub brush. This will remove the remainder of the paste. If the stain hasn't lifted or at least lessened, follow up with some warm water. Dry leather shoes thoroughly. You may blot canvas shoes dry, repeating the baking soda process until the stain is gone. For canvas shoes take an old toothbrush and a tiny dab of whitening toothpaste. Scrub the stain with the toothbrush and rinse the shoe thoroughly. Use the toothpaste for leather shoes as well, but use a soft cloth or paper towel instead of a toothbrush.